Do You Need a Garbage Disposal? Making minor updates in your kitchen can not only make it more convenient for you, but also help you cut back on your waste. Installing a garbage disposal is a great way to make your kitchen more environmentally friendly. 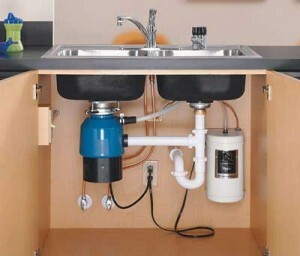 Having a garbage disposal installed underneath your kitchen sink is easy and affordable for all homeowners. This handy gadget works by grinding uneaten foods into miniscule pieces that can be passed through the sewage system. This makes an impact because it cuts down on the amount of waste that is disposed of in landfills. A garbage disposal is so recommended, because it offers numerous benefits to homeowners. This kitchen appliance will come in handy on numerous occasions. The amount of time that you are forced to spend cleaning can be greatly reduced by simply having a garbage disposal installed. Now you do not have to spend tedious time moving between your trashcan and your sink scraping of plates. You can simply stay in one place and gently scrape all food from your plates into your sink. This makes clean up after each and every meal so much simpler. You will be amazed by how much time you can save by making such a minor adjustment in your cleaning routine. Operating your garbage disposal is also designed to be easy and only requires you to turn on a switch. Not only will the installation of a garbage disposal make your cleaning routine simple and fast, but it will also have a positive impact on the world. This can be done by cutting back on the contribution of waste that you add to landfills. Sending your waste down the sewage system is ideal to having it lay in landfills around the world. Food waste accounts for about 20% of the total daily waste for every household, but having a garbage disposal installed in your home allows you to cut back. Reducing the trash that you send to landfills is a wide reaching benefit that a garbage disposal gives you access to. If noise concerns are what is holding you back from having a garbage disposal installed, you can let go of your worry. Our garbage disposals are specifically designed to create only low noise and are a convenient kitchen appliance for any home. http://knoxvilleplumbingllc.com/wp-content/uploads/2014/09/Garbage-Disposal-Services.jpg 256 300 Knoxville Plumber http://knoxvilleplumbingllc.com/wp-content/uploads/2016/09/Website-Logo-KNoxville-Plumbing-2.png Knoxville Plumber2014-01-29 16:06:202014-09-29 16:09:33Do You Need a Garbage Disposal?